Appery.io Database is a cloud database for storing any information or data for your app. For example, you can store app users, orders, purchases, pictures — or anything else that your app needs to store. The database is running in the cloud, this means that the app connects to the database via REST API. The database has two types of collections or tables: pre-defined and custom. Users – for managing users. For example, you can add user login and registration to an app. Files – for storing files. Devices – device information which have registered to receive Push Notifications. This collection is used to send targeted Push Notifications. For example, send a message to all users who subscribed to get news about travel. In addition to the pre-defined collections which are automatically available in each new database, you can create any number of custom collections (tables). Custom collections can hold any data. The database is accessed via a REST API. An API key is required to access any database collection. Further security can be added by making a database secure – this means a user login will be required before a database can be accessed from the app. The user is kept in the Users collection. In addition to using the built-in Users collection for user management, login into an app can also be accomplished via social networks: Facebook, Twitter and Google. More security and permissions can be specified via ACL (Access Control List). Every new records/object created in the database can have specific access control information. For example, only the user who created this object can read and write this object. Everyone else can only read the object. A special master key is also available which gives a root-like access to the database. The Database has a built-in Versioning feature. It allows to create an instance (copy) of the database and restore it at any point. The Database is nicely integrated with the Server Code component. 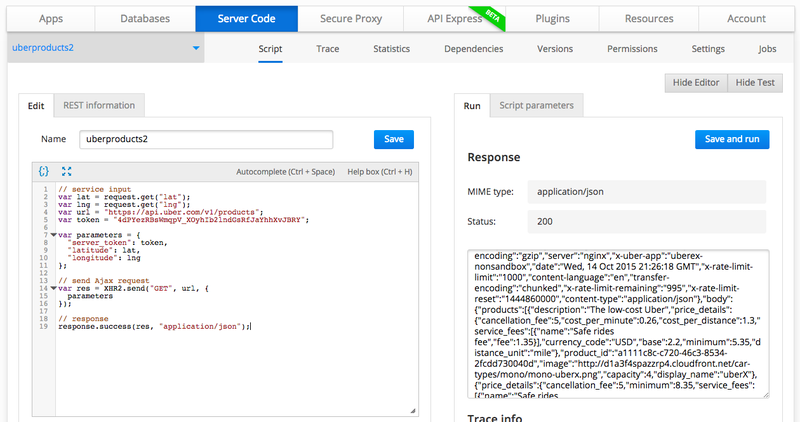 Server Code provides elegant API to access the database from a server-side script. We have a number of short videos on using the Database on our YouTube channel here and here. Also, instead of attaching the parameters to the URL, the script creates parameters object with all the inputs for the API. This script is more elegant and simpler to understand. I will be in Atlanta on September 15th showing how to rapidly build enterprise mobile apps with Ionic, Angular and Appery.io at the joint Atlanta Atlanta Mobile Developers Group and Atlanta HTML5 User Group meetup. Hope to see you there. Gone are the days where you can afford to take months to build an enterprise mobile app. In today’s fast market, you need to be able to prototype the app in a few days, release the first version in a few weeks, get feedback, fix bugs, release the second version. Repeat. In this session you will learn how to rapidly build a mobile app with AngularJS and Ionic connected to cloud APIs using Appery.io cloud platform. Yes, I want to learn how to build apps with Ionic and Angular. Register here or here. I will be in Salt Lake City, UT talking how how to rapidly build enterprise mobile apps with Appery.io. Hope to see you there. Gone are the days where you can afford to take months to build an enterprise mobile app. In today’s fast market, you need to be able to prototype the app in a few days, release the first version in a few weeks, get feedback, fix bugs, release the second version. Repeat. In this session you will learn how to rapidly build a mobile app connected to cloud APIs using Appery.io cloud platform. This is a live coding session where you will be able to test the app on your device, and we will package the app for iOS/Android. Yes, I want to attend. I will be in Washington DC talking how to build enterprise mobile apps with Angular and Ionic. Hope to see you there. Gone are the days where you can afford to take months to build an enterprise mobile app. In today’s fast market, you need to be able to prototype the app in a few days, release the first version in a few weeks, get feedback, fix bugs, release the second version. Repeat. In this session you will learn how to rapidly build a mobile app with AngularJS and Ionic connected to cloud APIs using Appery.io cloud platform. This is a live coding session where you will be able to test the app on your device, and we will package the app for iOS/Android. You probably didn’t know that Amazon App Store, Evernote, Twitter and other are hybrid apps. Read 8 High Performance Apps You Never Knew Were Hybrid.